Click PLAY and you can watch the ViAns short movie, our animation demonstrating an just a few seconds what ViA Card is all about. The ViA customer; You, are the 'foundation' for the whole ViA Model and ViA works for your interest and protect your values. ViA plan to become a global instant clearing and settelment solutions where you as the consumer and the small merchant becomes the winner. 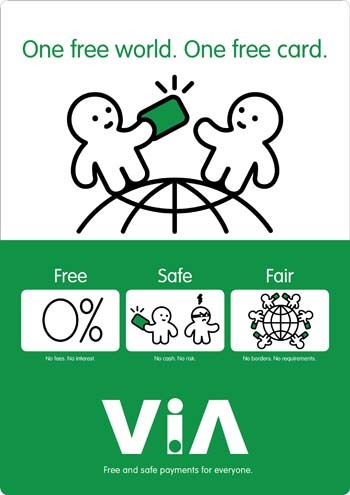 ViA - FREE SAFE FAIR The first payment innovation which revolutionize the way you as the consumer and you as a family can handle your values, in what ever form it is. Cash you have toped up to your ViA Account, the Salary you have got in from your employer or maybe money you have received from abroad or a friend or family member. From 5 to 105 year ! When you are a ViA customer, you can have your own ViA Online™ account, which you can easily access from a mobile phone, laptop, tablet, iPad or any other device using internet. Or you can access your details when you are visiting a ViA Merchant. You can create account to your children or family members and you can control their spending as well as pre-a prove where to spend their values. ViAns always her for you! The ViAns is always there to help and explain things in the most easiest way, in a better way!. You will come to find the ViAns at many places, just click on the ViAns and you can read and learn more. ViA is Simply - Simple! Being unbanked consumer, doesn't mean that you do not use money or do not buy anything. Unbanked consumers are all of us who do not 'fit' in as bank preferable customer. Banks are expensive to operate and they are now days commercial and owned by shareholders who expect return on their investment, so the bank need to deliver a profit. If you 'just' get your salary in to an ATM card or a debit card or a normal bank account and take all the money out, than you are not seen as a 'preferable' bank customer. As many as 60% of consumers in the world are unbanked and if you add the age 5-18 plus elderly people, the unbanked consumers quickly adds up to 4 times as many as the bankable. 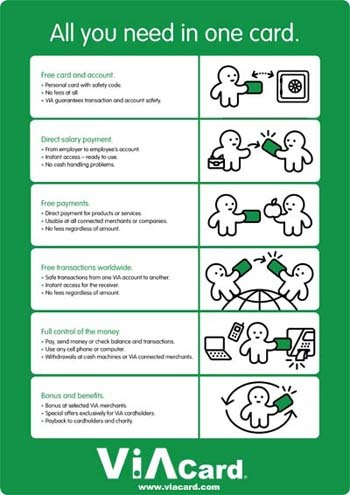 The ViA Model is a true payment innovation, a disruptive model which turns the traditional why on how we do business and treat consumers and users, up side down. Makes you as the consumer the if WINNER and the one who will find protection for how to earn real values back, because it has a value to be a consumer. Standing alone, difficult to achieve anything, but together with millions of other ViA members and customer, the ViA customer has a new voice in the society. ViA Card - all you need!